The founder of the farm, Benito Piva, was born in Mantova from a farmers family. He loved with passion working on the land and his sincere enthusiasm for his work eventually gave life to the contemporary farm and to the Agriturismo ( farm holiday home ). Grandfather Benito, after having bought various polts of farmland on the Conca Valley ( Valconca ), created his farm, which he named after his daughter Fiammetta. The farm now extends over 41 hectares of land: 20 hectares of woodland, while the remaining area is dedicated to farming : vineyards, olive groves and alfalfa. Benito nephews Francesco, Jacopo and Matteo are now running the farm with love and great passion, following the family tradition that their father’s Carlo Panzeri ( Fiammetta’s husband ) handedthem down. Their father carlo Panzeri is an agronomist whose particular expertise is tilling vineyards and grapes, the nine different types of biological wines produced at the farm are their family reward. Fiammetta’s wine cellar arises from the connection between grand father Benito and his land, grand father Gelindo and his wine cellar. Imagine a little girl riding her bicycle through the hills, vineyards and enchanting villages of Rimini. She comes down through grand father Benito’s vineyards, named “Benedictus,” through the village lanes and she chats with the wise Gelindo, who is a great connoisseur of vineyards and above all, an expert host. She observes the little firefly floating around in front of her. Fiammetta daydreams all the time. And at the end of the day she finds her self in the midst of a rich banquet. Music from a clarinet to soothe the day. A cheerfull companion. These are the things that make Fiammetta’s life more colorful every day. We are the first Bio wine cellar of Rimini. We have a strong mission: to give life to the earth by bringing “home grown grapes” to the table. I came into the world in Cattolica on the 17th of August in 1948 and later obtained a degree in Foreign Languages at the I.U.L.M. University in Milan. After my studies, instead of becoming a teacher, I decided to help my parents out with their hotel, and subsequently, my husband and sons in Fiammetta Agricultural Holding. In 1996, I earned an entrepreneur certificate in Agritourism Business and I am now in charge of the agritourism business area. I am very proud of our family-run business and of my family’s work. Overcoming obstacles and differences, we are always growing as a team and as a family… united as “shoots to grapevine”. I was born in Milan on the 9th of February in 1949 and I graduated from the Agrarian University in Milan. 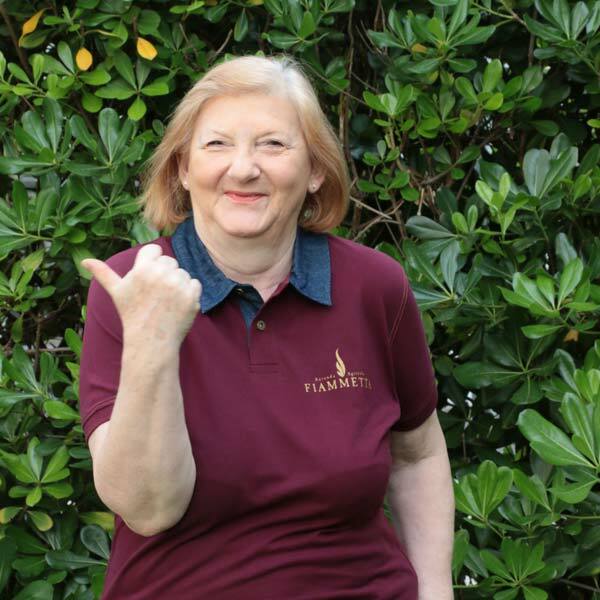 It has been a life choice since the very beginning, the same choice that brought me to Romagna to manage Fiammetta Agricultural Holding, my true passion. It has been everything from classical crop rotation to laying hens and Holstein Friesians to producing milk. After that focus, we began to focus on wine. It started as a handcrafted production and then became more professional with the production of nine different kinds of wines. Today, my job is training a strong and cohesive team made up by my sons Matteo, Jacopo and Francesco. Each member of the group has a specific assignment and together, we fulfill our common objective—making good wine the way it was in the olden days and, above all, with love. Born in 1973 and hailing from Rimini, after obtaining a degree in a Second Level College of Science, I attended a Sport Management Program at the LUISS Guido Carli in Rome. After finishing my studies, I started working as a sporting events organizer for both amateurs and professionals. Then, at age 30, I had a brief but significant experience working as a sales manager for Del Conca, a company leader in the production of floor and ceramic tiles. 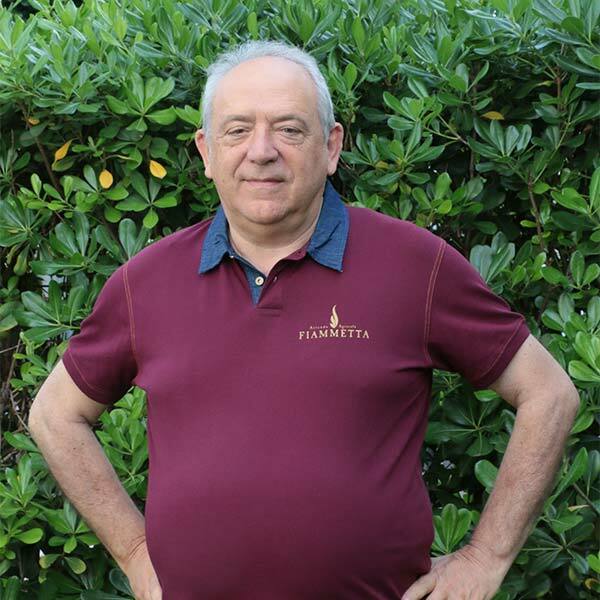 Since I was a boy, I have always helped my father Carlo with his business, both on the farm and in the winery, up until 8 years ago when he asked me to be part of the family company. I gladly and proudly accepted his challenge. I have been playing basketball for 25 years and even had brief stint in Serie A. I love all kinds of sports and I also am a mountain bike guide. I earned an AIS (Italian Sommelier Association) degree and I have a deep passion for wine in all of its aspects. I feel truly fortunate to be working in the field and my motto is: “When strength fails, the heart pushes ahead!”. Class of 1976, I earned an accountant qualification at Valturio School and worked in the CSA (Environmental Research Centre) in Rimini for a year thereafter. I felt a strong calling from the “Land”, and in 2001 I joined my father’s company developing “fieldwork” both in company management and wine production, as well as in quality control, which I am still doing as of today. Meanwhile, I continued keeping up to date with Educational Courses on Agritourism and Organic fields, earning AIS (Italian Sommelier Association) levels I and II degrees and obtaining a lifeguard certificate for the swimming pool used for our agritourism. I love my job and our slogan “Land, grape, love… today, it’s not only wine that you’re drinking” fully encompasses me and who I am. 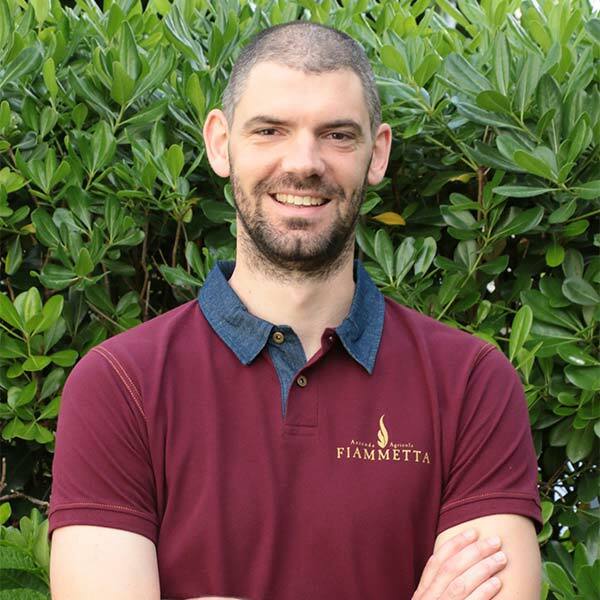 Born in Rimini in 1984, after graduating with a degree in Classical Studies I spent a year doing Civil Service for the UISP organizing sports courses and events. Sports, especially basketball, are one of my true passions. In 2014, I earned an ONAV degree (National Organization of Wine Tasters) and was introduced to the amazing world of wine and organic agriculture by my father and brothers. It was then that I became a part of the company. Today, I work as the commercial manager for the company and am also in charge of customer service, accompanying customers during guided tours and product tasting. Moreover, I provide support for any needs the company may have, whether they be deliveries or winery works. 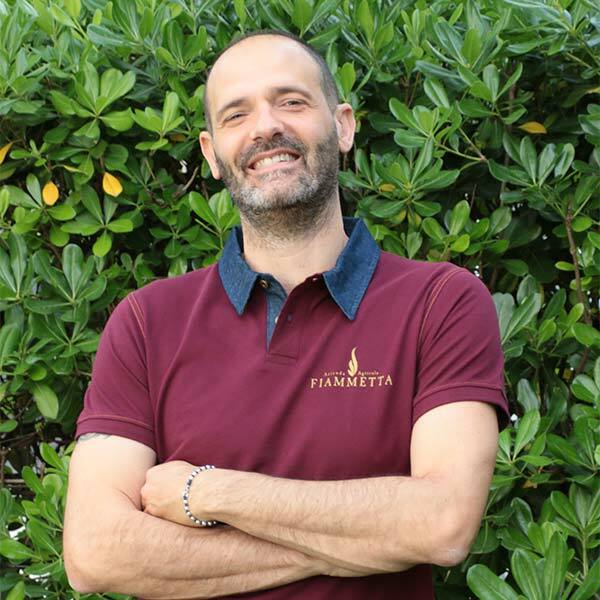 Working together as a family is a true blessing and a real pleasure—I am proud to be part of the “Fiammetta Team”. 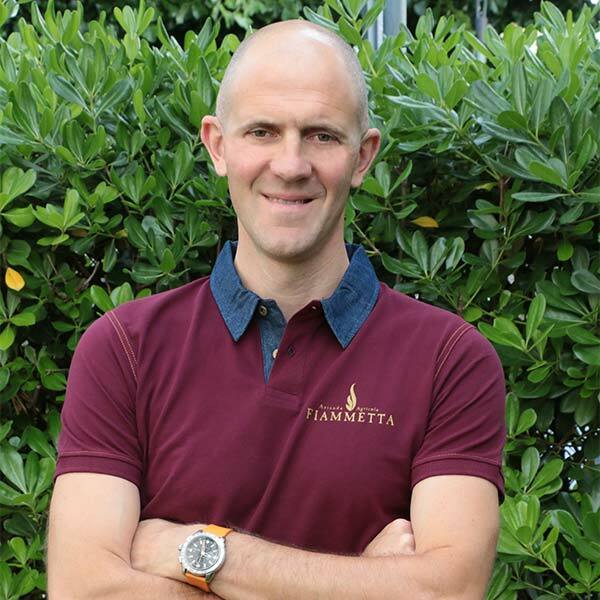 Fiammetta Agricultural Holding developed its passion for wine many years ago. Its story began in Affori, a district of Milan, in the wine cellar of the “Trattoria Santo Stefano”. It was there that Carlo, as a young child, first began helping his grandfather Pin (Giuseppe) to fill wine bottles for the restaurant’s diners. Family and love are the key elements for making a good wine. In addition, the remaining necessary ingredients are a love for the land, teamwork, a vineyard facing the sun, and medium mixture clayey soil that holds water in winter to release it slowly during the hot season. For more than 20 years we have chosen to be organic, a strict but satisfying path that does not include the use of any chemical fertilizers, antiparasitics, or chemical herbicides, but rather a mechanical cultivation with natural fertilizers and a reduced use of preservatives. Our wine is produced “like the olden days”, simply and without sophisticated techniques. The result is a fruity product that represents real wine and that reflects our philosophy: “Land, grape, love… today, it’s not only wine that you’re drinking”!